Headsets and audio equipment reviews are hardly a daily occurrence here at GSMArena, but most of us have deep personal interest in the area. That’s why the TONE Platinum SE caused quite a lot of excitement here at HQ and I was nominated to share some of that with it. Heads-up this is going to be more of a personal experience review than a benchmark-filled test. First things first, then. 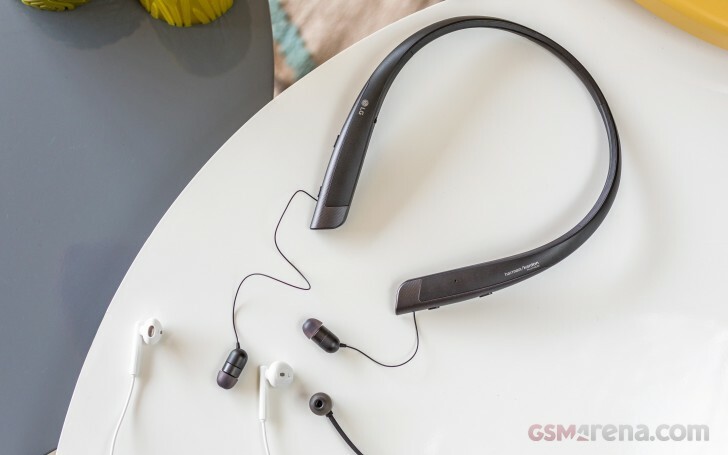 We have used and even reviewed LG Tone headsets in the past, like the LG Tone Infinim HBS-900 and the HSB-730 Tone+. And the basic design concept and form factor are pretty much unchanged since. However, the TONE Platinum SE with its Google Assistant puts the headset in a very unique position. LG does have a regular LG TONE PLATINUM (HBS-1100) currently on offer for pretty much the same $200 MSRP as the HBS-1120 TONE Platinum SE. That one lacks the Assistant integration, but it does offer a somewhat more premium material build with anodized brushed aluminum. The LG TONE Platinum α seems to be a closer match – same overall design as the TONE Platinum SE, sans the Google Assistant functionality, at $150. So, here comes the key question that needs an answer – is the Assistant integration good enough to make you spend $50 extra? Simple enough. If you are faced with a purchase decision yourself you may want to keep in mind that the TONE Platinum SE only supports Bluetooth v4.2. In contrast, the cheaper TONE Platinum α model is rocking Bluetooth 5.0, and in turn an hour longer endurance, out of the same 220 mAh battery pack. Nothing too significant, but still would have been nice. 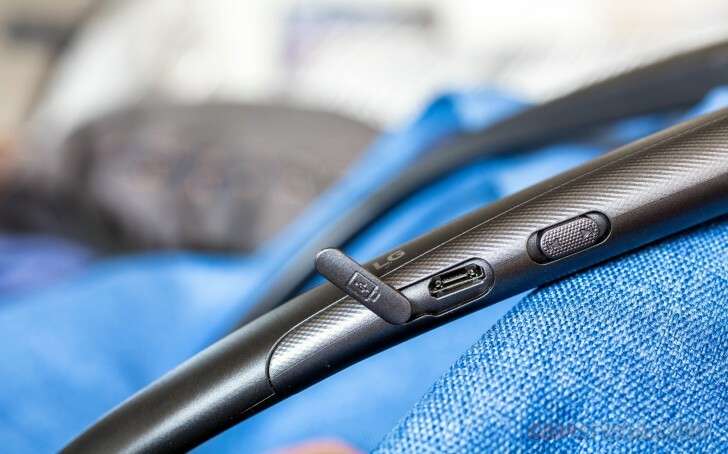 Design, quality and comfort often outweigh specs when it comes to headset purchases. Like most of the LG Tone line, the TONE Platinum SE has a very solid feel to it. In fact, tipping the scale at just over 54 grams, you can definitely feel the neck band. Now, whether that’s a good or bad thing will definitely depend on your personal taste and the intended usage of the TONE Platinum SE. 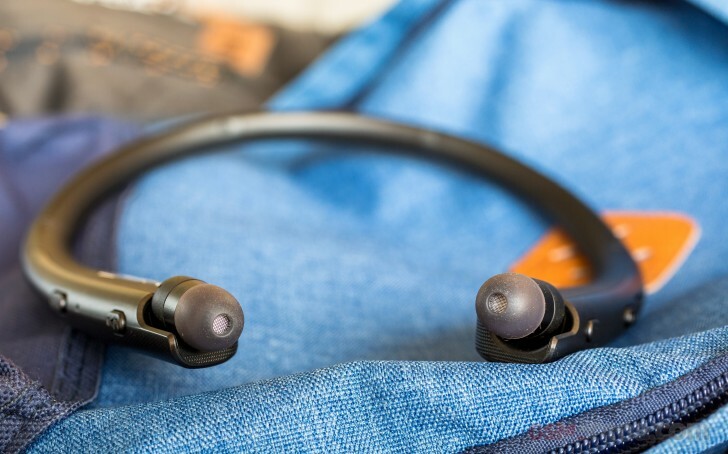 I definitely appreciate that the particular design practically eliminates nasty tugs and pulls on the cords and earbud displacement. However, they are not exactly well suited for sports, since the strap tends to bounce around a lot. Unlike the other popular head-strap design, though, which might be better suited for sports, the neck band works a lot better while laying down on a bed or reclining on a couch, since it sits comfortable on your shoulders, instead of getting pushed around by the cushions or pillow. 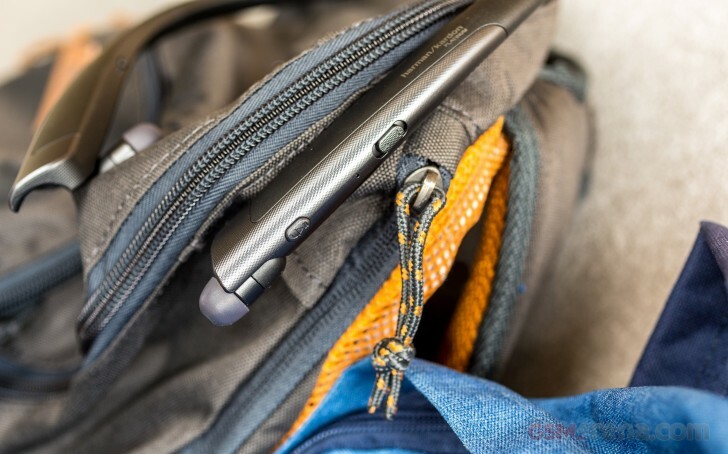 You can definitely find even more comfortable Bluetooth models out there, featuring only a thin wire between the two buds, which could be even more comfortable, but that also means sacrificing on battery, among other things. Bottom line, the TONE Platinum SE win plenty of points in the ergonomics department, when judged within the constraints of their particular form factor. I already mentioned the LG TONE PLATINUM (HBS-1100) offer a few extra premium material choices, but unless you are really into the brushed metal look, I kind of prefer the TONE Platinum SE. The primarily plastic construction feels really sturdy and the carbon-like textured finish on both ends makes for a nice little two-tone look and accent. At the back, the two parts are joined together by a flexible yet rigid bit of softer plastic, which I particularly enjoy. It instilled enough confidence in us to just place the TONE Platinum SE in a bag full of luggage, without worrying about a case or any other protection. It’s not all good though. I do have my reservations about the retracting mechanism. The wires seem rather thin so it’s unclear how much tugging and pulling they can survive. The retracting motion is not smooth and if you’ve ever owned a retracting cable, you know it is bound to get stuck at some point and leave your buds hanging. In fact, during the review, I managed to get a couple of pretty scary jams, which were only resolved after very careful pulling and releasing. Having used the older HSB-730 “hanging wire” system in the past, I have to say, it definitely gave off a more reassuring initial impression. In fact, seeing how the magnets on each bud still work with the cables fully extracted, I simply decided to stop using the mechanism at some point and leave the wires hanging. While on the subject of the buds, I have to note that like any good high-end unit, the TONE Platinum SE includes more sizes of the plastic tips in the box. LG’s has had plenty of years to perfect its material of choice and it feels really comfortable, even for prolonged wear. I’ll wrap the hardware tour up with a few words about the controls, of which the TONE Platinum SE has quite a few. I like the “clicky” and nice tactile nature of the buttons and the satisfying linear actuation of the sliders. Also, I appreciate that the power switch is an actual switch and that it’s in a hard to flick by accident place. It did cause a few issues with setup, but more on that later. We also have to congratulate LG for giving the Google Assistant its own button on the right-hand side instead of implementing it as a gesture on the play/stop button. I wasn’t as thrilled to find an increasingly outdated microUSB port. Simply for the sake of convenience in carrying around one less cable we deserved a USB-C port. Also, next track is down on the right control, but on the left control down is volume down. The latter makes sense, but the former much less so. Apple’s AirPods are pretty much the benchmark for straight-forward and easy setup. You just bring them near your phone, open up the case and like magic – a notification pops up on your iPhone to connect. Google couldn’t afford to stay too far behind the curve and also implemented a similar setup routine and shipped it to all Android devices, running Android 6, or newer, with Google Play Services 11.7+. So, chances are, you have the hidden party trick as well. 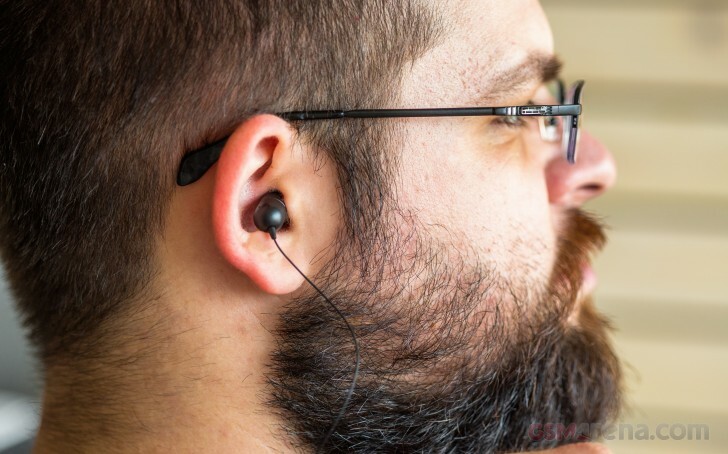 However, it can hardly be observed in the wild, since the list of supported headsets for what Google has dubbed Fast Pair is short, to say the least: Google Pixel Buds or Libratone’s Q Adapt On-Ear, Bose QuietComfort 35 II, Plantronics Voyager 8200 series. And, apparently, the TONE Platinum SE, even though it is not listed. The way setup goes is this: You turn on the TONE Platinum SE and bring it close enough your phone (in this case a Samsung Galaxy Note8). Then a BLE broadcast form the phone was picked up by the headset as long as you have Bluetooth and Location on (I seriously don’t know why the latter is a requirement). 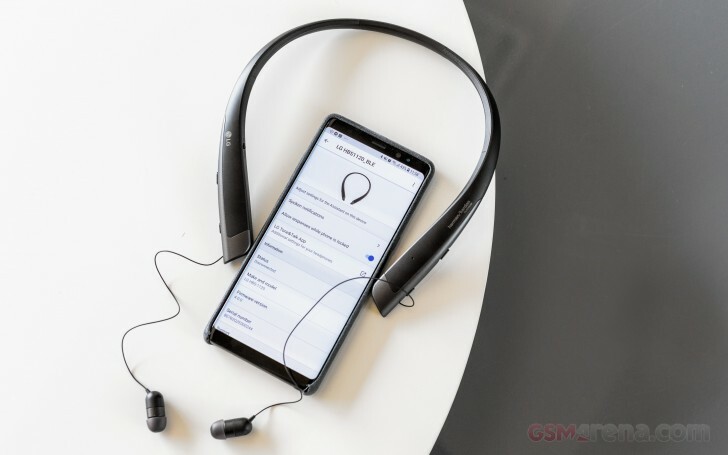 Anyway, after that the headset sent back its device ID to the phone, it contacted Google servers and fetched the appropriate product image, features and app compatibility information in the background. So what you get is a simple, one tap notification. Color us amazed! However, this is about the point where simplicity ended. Tapping the notification lead us through a whole Google Assistant setup, for some reason. Even though it was already up and running on the test phone. One of those steps included going into the permission settings and granting the Google Assistant access to notifications. Fair enough, since one of the cooler features of the TONE Platinum SE is the ability to hear your notifications read outloud, by the Assistant. Plus, let’s be real here, it’s not like you can hide anything from Google anyway. Once all that is done, you get to see the available Google Assistant settings menu, which is actually pretty well organized. You get some basic information about the device you are using, including the battery level and a menu to control per-app Spoken notifications. So why all the whining then? Well, remember when I said that one of the steps in the setup process included the phone fetching some app and features info for my particular TONE Platinum SE headset off the internet? 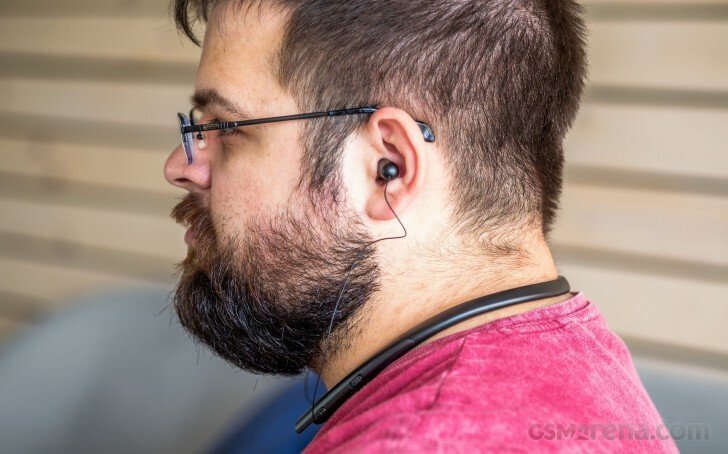 Well, the Assistant really insists you install LG’s Tone&Talk app off Play Store to get access to all of the features of your shiny new headset. Another fairly quick setup later, you get a similar interface, with a battery meter, some hero graphics and settings menus. Pretty repetitive already. Then, the app prompts you to give it access to your notifications as well. Then things got really confusing. I thought I had already enabled the voice notification features and selected my apps within the Google Assistant. Yet, here are more options for it with some interesting, but very confusing conditional settings, sprinkled in. The speech rate selector is a nice touch, though. Furthermore, there is an entire section for vibration notifications, entirely separate from the voice one. LG seriously needs to re-work this. There is an EQ setting within Tone and Talk, but it is only available while you are playing music, otherwise it appears grayed out. With so many buttons on the TONE Platinum SE, one would imagine that there would be a lot of options for custom shortcuts. That isn’t really the case in the current state of the app. You get to customize what a long press on the play/pause/call button does, but the only options are related to calling contacts. Holding down the next song button can either start a voice memo or tell you the current time. That’s it. Another slight annoyance is the persistent notification that is left in my notification shade by default. Plus, SmartThings is also picking up the TONE Platinum SE and providing an extra row of controls to take up space. The latter is admittedly a Samsung issue. Mercifully, you can turn off LG’s persistent notification, but that can lead to Android, in its OCD ways, often closing out certain services in the background and breaking things like the Assistant integration. I’ll get back to that in a minute. Last, but definitely not least. I got this constant toast notification pop-up on my phone, with the remaining battery percentage on the TONE Platinum SE. The logic driving eludes me as it didn’t seem to matter if the batter level has changed or not or what I have open at the moment. It simply pops up once every couple of minutes, just to nibble at my sanity. At lest, I never got notified about something or read a notification twice, as a result of two apps apparently trying to control the text to speech features. After getting somewhat bombarded by the Android setup process, I decided to move on the the PC and see how well the TONE Platinum SE works on that front. As we already mentioned, there is sadly no multi-point support, so had to turn off Bluetooth on my phone. Since the power button is an actual switch, rather than a button, like on most Bluetooth devices, the trusty old “hold until the status LED blinks” trick was not applicable. After fumbling about for quite some time, trying to invoke some manual connection mode I finally saw the headset pop-up on my Windows 10 PC notifications right after simply switching it off and back on. Finally, you’ve set up the TONE Platinum SE and all of the proper notification preferences, across the two apps. So, what is it like to actually use the Google Assistant on a daily basis? Well, that all depends on how familiar and comfortable you already are with the Assistant. While holding down the special button on the TONE Platinum SE, you can talk to it without using any trigger word, thus saving yourself that little bit of extra awkwardness. Feature-wise, LG hasn’t really added any specific trigger or action on top of the standard Google AI experience. You can still do searches, control music playback, send out messages, control your smart home – the works. At least, most of the time, that is. The TONE Platinum SE has the nasty habit of constantly loosing its connection to the Google Assistant. We were, originally, ready to blame Samsung’s background service management for that, but switching over to a Huawei then a Moto simply changed the frequency at which the problem occurred. So, pretty frequently, holding of pressing the Assistant Button simply yields a “Google Assistant is not connected” voice prompt. Other times, when the Assistant did work and started listening, it would go quiet, stop listening in the middle of a sentence and then never really recover. Sometimes that would leave my music player constantly paused. Just random nasty hang-ups all around. The voice notification feature is, admittedly, pretty neat. But it is also far from perfect. By tapping the Assistant button once, you can get your new notification read via text to speech. I really recommend filtering the apps you really need dictated to you, since even at the highest pace of reading, the process still takes quite a bit of time, since the AI isn’t smart enough to skip through unimportant parts of email headers or any meta info, present in the notification. The dictation voice also sounds pretty rough and robotic, compared to the Assistant’s increasingly humanized tone. But, that’s mostly nitpicking. Another nifty feature that we haven’t mentioned so far is the Google Translate integration. It goes like this: You get the Google Translate app, then simply hold down the Google Assistant button on the TONE Platinum SE and say something like “Help me interpret German”. That then launches Translate with the proper settings. The way the conversation goes is that you press and hold the Assistant button and talk, then the translation plays through the phone. 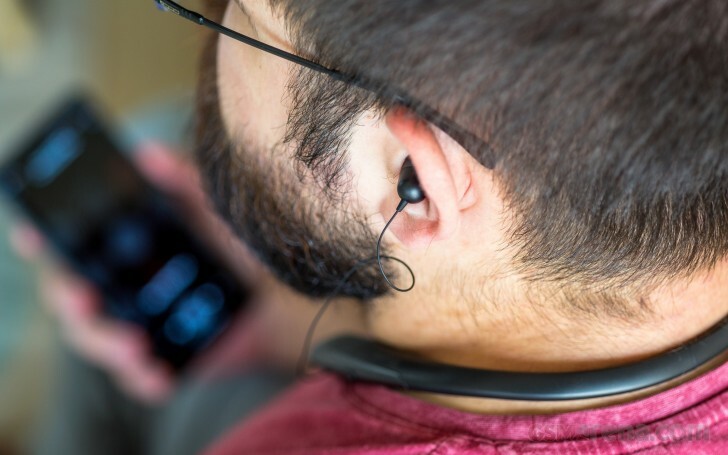 The other person has to talk into the phone for you to hear the translation into the headset. For the most part, it works and doesn’t suffer quite as much from connection issues, probably since it doesn’t use a background service. However, I have to note that you an accomplish the same thing using the Translate app alone. 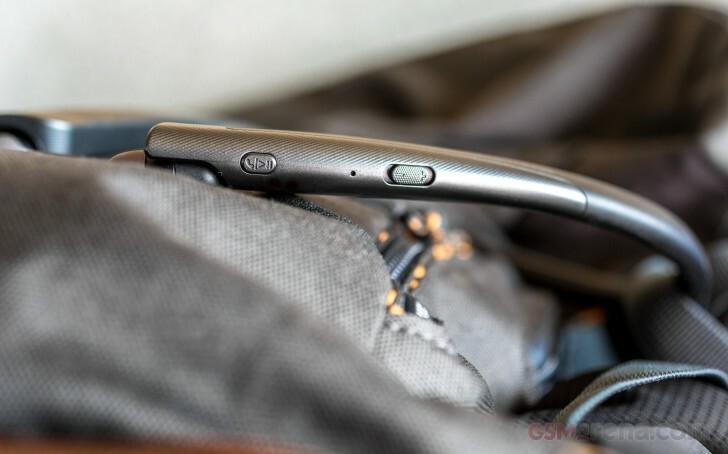 Calls are a cornerstone convenience feature of most smartphone headsets nowadays. 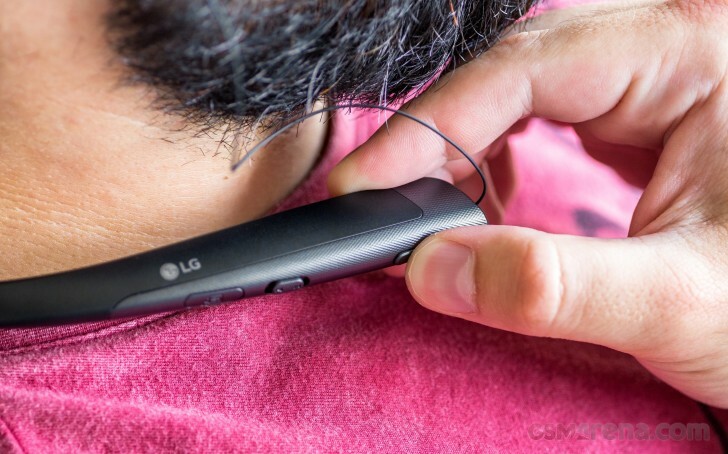 LG promises an improved experience thanks to the Dual MEMS microphones on the TONE Platinum SE. Apparently, these are “strategically” placed on the top and side of the device to ensure clearer sound with less noise. Yet I found the microphones’ sound rather distorted and quiet. I frequently got complaints during calls on the TONE Platinum SE. People mentioned echo, as well as low volume, which forced me to lift the microphone closer to my mouth, kind of defeating the purpose of a headset. Last, but not least, we have to touch on general sound quality. 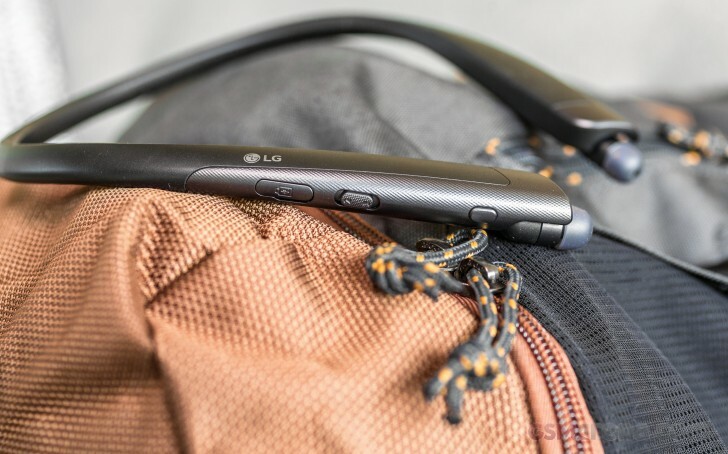 In keeping with tradition, LG has collaborated with Harman Kardon on this front, who, apparently provide the “tuning” part of the sound equation. In terms of hardware, the has two Hybrid BA speaker units. Its main pitch seems to be a “high precision band separating tube for perfect separation of bass, mid and high ranges, without interfering”. Without throwing around any lofty audiophile claims, I will give LG that one. Still, I wouldn’t exactly call the sound the TONE Platinum SE produce really dynamic, nor the tones exceptionally clear. Nothing is blown out of proportion and the experience is balanced, but not spectacular. I have no real complaints in the battery department. The TONE Platinum SE mostly deliver the advertised numbers of about 12 to 13 hours of playback or talk on a single charge. Of course, it depends on volume. That’s perfectly fine in my book, since the number roughly matches the multimedia playback endurance of a normal phone and is effectively an all-day charge. The headset constantly loses connection to Google Assistant. Software and connection bugs are common. Tallying all the pros and cons up, it is really hard for me to give an instant recommendation for the TONE Platinum SE. Then again, the headset scene is so rich and diverse that no one headset can realistically be a perfect universal fit for everybody. In fact, not even for every occasion. If you find the neckband form factor convenient and comfortable enough and the Assistant integration really appeals to you, then the TONE Platinum SE could be a great choice.